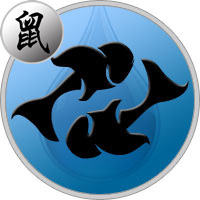 Dreamy Pisces under the influence of restless Rat acquire activity and cheerfulness. They are not as sensitive and sensitive people as other representatives of the water sign. The rat gives them the ability to think rationally, they do not get discouraged from the slightest trouble. Although in the life of people of this combination of signs there are difficult moments when they become especially vulnerable. Pisces-Rats are of a benevolent character, always calm, even shy. Have intuition, behave with restraint and cautiousness, try not to commit rash acts. However, they will not tolerate a disdainful attitude towards themselves, fearlessly confront evil and injustice. The surrounding people do not always understand the actions and actions of the Rat-Pisces. This quiet, modest man tries not to attract attention to himself, he is polite and friendly in communication. Although Rat-Pisces is an interesting personality, woven from contradictions. The person of this combination of signs is quite capable of becoming a leader. Has a sharp mind, developed imagination, delicately feels people. However, he absolutely does not need admiration, worship. Most of all he appreciates tranquility and coziness, loves his house, is very attached to his relatives. He is inclined to idealize people, expects them to understand, help at a difficult moment. He does not believe in lies and betrayal, he is sincerely surprised and upset if he has to deal with meanness and deceit. They are surprisingly modest people, quite satisfied with their position in society. They like to dream, often reflect on a variety of topics. Most of all they are interested in psychology. They study people with great enthusiasm, they try to understand the motives of their actions. Observation, a subtle flair — the distinctive features of Pisces-Rats, thanks to which they always make the right conclusions. It is impossible to remember any reckless misconduct that they committed. On the contrary, they are serious, responsible people who perfectly control their behavior. They can be accused of some detachment, of excessive dreaminess, but not of anger and self-interest. Pisces-Rat — a man with a crystal clear conscience. Charming Rat-Pisces are tactful and polite in communication, skilfully bypass awkward moments. And behave so not out of a desire to seem better, they are really well brought up. They are very kind people, ready to sacrifice themselves for the sake of everyone’s happiness. Sincerely wish to bring something good to the world, help all those in need. Pisces-Rat will be able to accept disrespect towards himself, but will not allow insulting loved ones. In an instant, this shy person can turn into an avenger, thirsting for the enemy’s blood. Has a keen sense of justice, categorically does not accept cruelty. Nature has created him sensitive to the suffering of others, he can not be different. In the romantic relationship of the Pisces-Rat, the feeling is completely given. Experiencing a strong affection for a partner, strives to get married as soon as possible. This sublime, refined nature, dreams of great love, dreams of creating a strong family. In marriage, does not accept rudeness and cruelty, will not get along with an oppressive partner. Strongly worried because of quarrels and scandals, does not like to find out the relationship. They are ready to give up their opinion, just not to bring the matter to a complete break. Pisces-Rat — the embodiment of conjugal and parental love. Sincerely attached to all members of their families, they try to surround them with love and care. For these people, the greatest value in life is native people. Impressive and vulnerable, subtly feel what is happening around. A favorable home atmosphere inspires confidence and optimism in them, and negative emotions drove into depression. Creative Pisces-Rats decorate their house with great taste, for them this is the most favorite place on earth. These people are more concerned about spiritual comfort than the financial component. Do not feel the slightest desire to lead the work of a large team. On the contrary, the need to spend every day among a huge number of people scare them. Pisces-rats are quite satisfied with a modest position with a small salary. At work, they are valued for a responsible and serious approach to their duties. They always work with great enthusiasm, get on well with all employees. Pisces-Rats are quite able to organize their own business, in the solution of business issues most often rely on their intuition. They are able to anticipate future events, they are practical, they maintain excellent relations with partners. However, they are too vulnerable and can not boast of iron restraint. Therefore, preference is given to quieter occupations. They get on well with people, especially with children, most often they choose professions related to communication: a teacher, a psychologist. The Pisces-Rat man expects understanding from the surrounding people. In any circumstances, behaves tactfully, prefers to live quietly and modestly. The most favorite place on earth is a house where he feels completely safe. Well-educated person seems completely unfit for real life, but, in spite of his softness, will not tolerate injustice, lies and betrayal. Colleagues highly value the executive, who does not bring cares and problems. He carefully hides all his grievances and experiences, he needs a kind, understanding partner who can inspire confidence in him or, at least, will not reproach him with endless quibbles. The Pisces woman, born in the year of the Rat, is distinguished by a calm character. A beloved man can be sure that she will adequately accept any, even unpleasant news. Do not panic, just begin to perform the necessary actions. At the same time, she is a gentle, vulnerable nature, although she tries not to show her real feelings openly. The Pisces-Rat woman chooses a job that is not connected with travel, is very attached to her home. The main value of life is a strong family, will do everything possible to preserve their marriage. She is ready to follow the man without asking any unnecessary questions. Her whole life is devoted to the interests of her husband and children, she enjoys real care for their welfare.